“What type of food do you eat?,” she asked. Like a deer caught in headlights, I replied: “Ummm, food? Vegetables? … Homemade! Well, I mean, we do like to go out to eat, too … I don’t know. 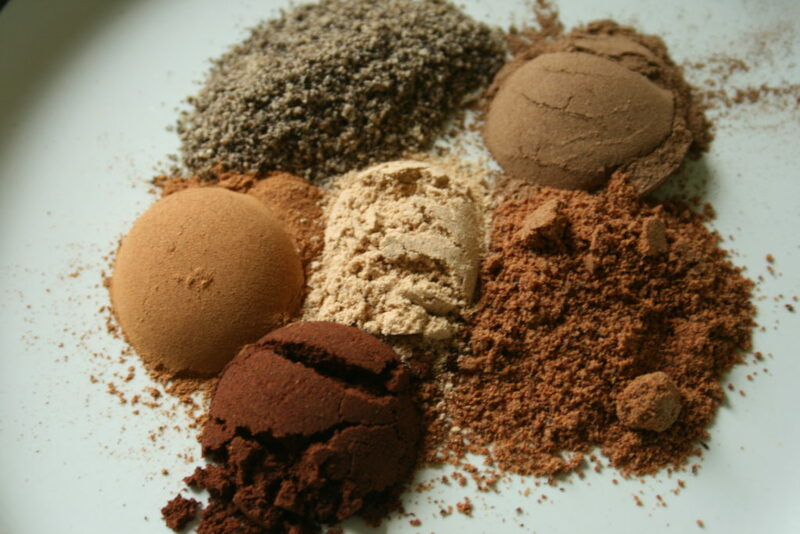 Just real food.” Like many city-dwelling young adults these days, my diet is a little bit of everything as bits and pieces from around the globe cross my path. It doesn’t matter to me from what corner of the world it hails, just as long as it’s good and it’s real, I’m down. Sometimes I wonder if my body is confused with the array of ethnic foods. Spicy enchiladas, sweet Teriyaki, tangy garden pizzas, zesty lentils, in no particular order, but definitely mixed up from day to day… all the foods of all the world are so good! I do like to cook, but I haven’t studied it, and I don’t read up on it. So I feel a little sheepish about ME sharing a Syrian recipe with you, but this dish is just one you have to make if you have some eggplants, ok? Don’t ask me questions about Syrian cuisine, because I really don’t know. All I know is that Maldoom is good, as introduced to me by this book I received as a gift. If you’re not Syrian, that’s ok, try this recipe. It’s so good and easy, too. If you’re Syrian, first, please forgive me for presenting your cherished dish (I do hope it looks right), I just couldn’t keep the secret on this dish under cover. Second, please teach me more of your cuisine! Ok, on to the recipe. Enjoy! In the next gardening season, I’ll update these photos with Italian eggplants. You know those gorgeous globes of beauty? They’re round and plump. 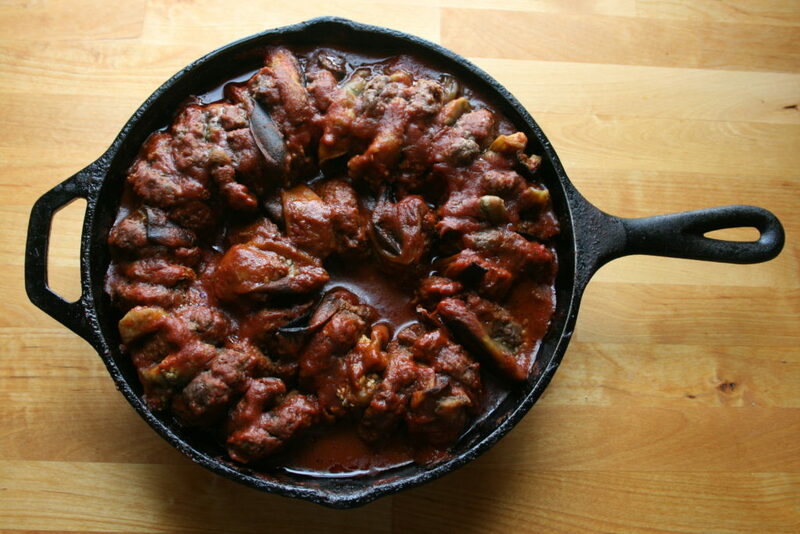 That type of eggplant will work better for this recipe. Thanks to scratch-happy chickens who always seem to find a way out of their movable fence, I only have Asian eggplants this year. They are tasty, but the long skinny shape is less ideal for this recipe. You’ll need two large Italian eggplants. In the photo is my less ideal haul of Asian eggplants. I used all of these for the dish. If you find yourself with only one Italian eggplant or a smaller stack of Asian eggplants, this recipe could be cut in half and still feed 2-3 people. With a busy life (leftovers are so convenient!) and a family that eats like goats, I always maximize the time and mess that cooking takes by making big meals. This pan of Maldoom should provide 4-6 adult servings with sides. 1. 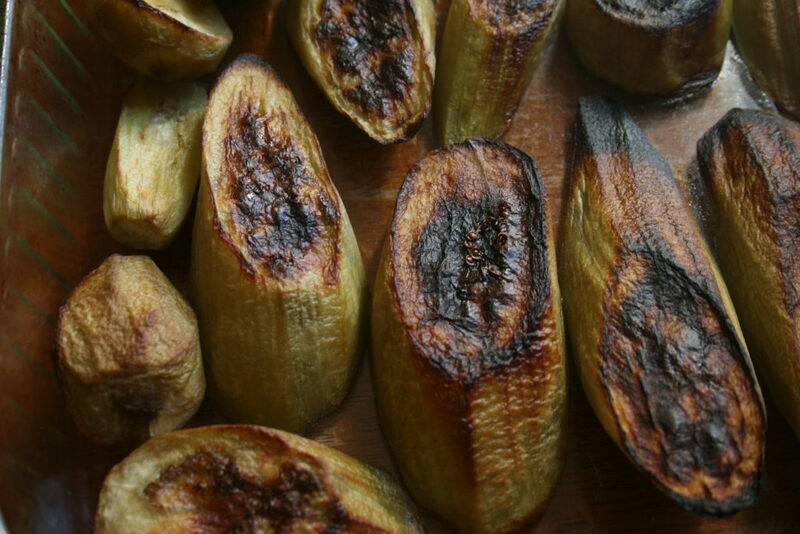 Remove stems and peel the skins off the eggplants. 2. 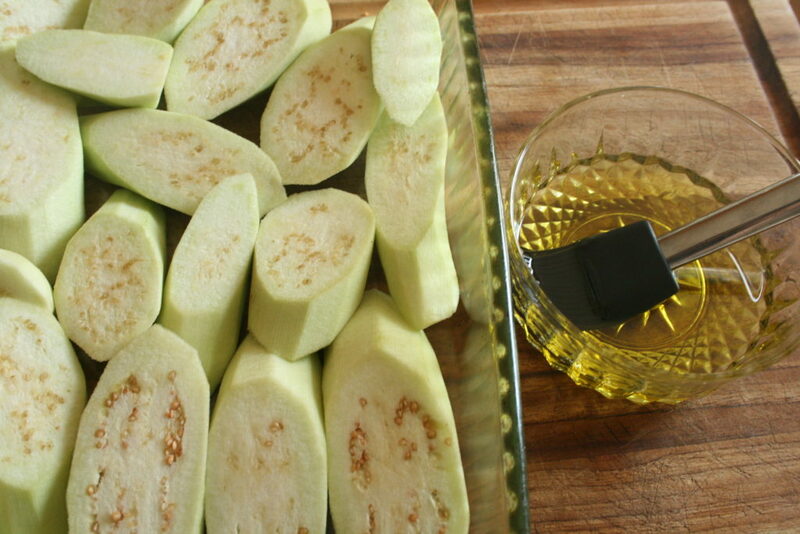 Cut eggplants into 1-inch thick slices. The diameter doesn’t matter too much as you’ll make your beef patties the same size as the eggplant slices. We make our slices roughly two inches across. 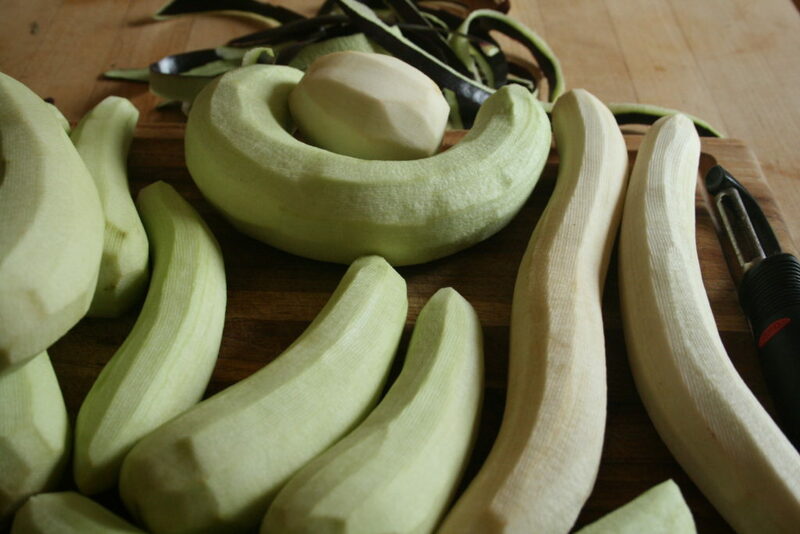 If it’s a large eggplant, you can quarter it, then slice in 1-inch thick sections. Brush both sides of the slices with olive oil. TIP: Do not drizzle olive oil on eggplant slices! It soaks right in and does not spread around. Use a basting brush. If you do not have a brush, pour some olive oil on a plate, quickly dip the side of the eggplant in the oil and flip to dip the other side. 3. Place the eggplants under the broiler until browned. Flip the slices over and return to the broiler until the second side is browned. 4. While the eggplants are in the broiler and cooling down, prepare the meat. Place 2 pounds ground beef in a bowl. 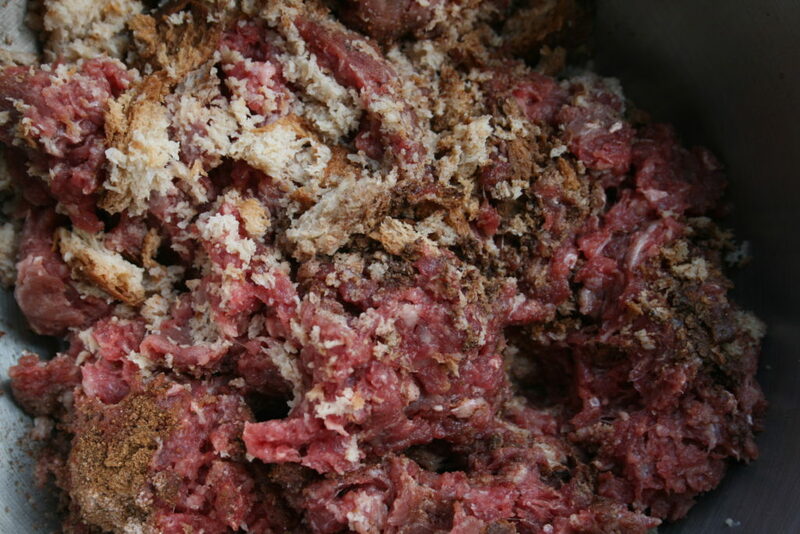 To the bowl of meat, you will add the bread and spices as explained in the next two steps. 5. Place two slices of bread in a small dish and cover with water. Allow to soak for a couple minutes. Squeeze the water out as shown in photo and add it to your meat. This makes the patties softer and much creamier, but if you wish to omit the bread for dietary reasons (it’s a great Whole30 dish), this recipe will still be successful. 6. Syrian pepper is not something many of us have on our spice rack, but it is made up of common spices, so I usually mix these together in a custard cup while the bread soaks. At the top is 1.5t black pepper, then working clockwise is 1t each of allspice, nutmeg, clove, cinnamon, and 1/2t ginger in the center. If you have white pepper, you should add 1t of that, too, but I don’t and it tastes great without. Mix these thoroughly and add 3t of the mixture to the meat. 7. Work all this goodness into the ground beef. 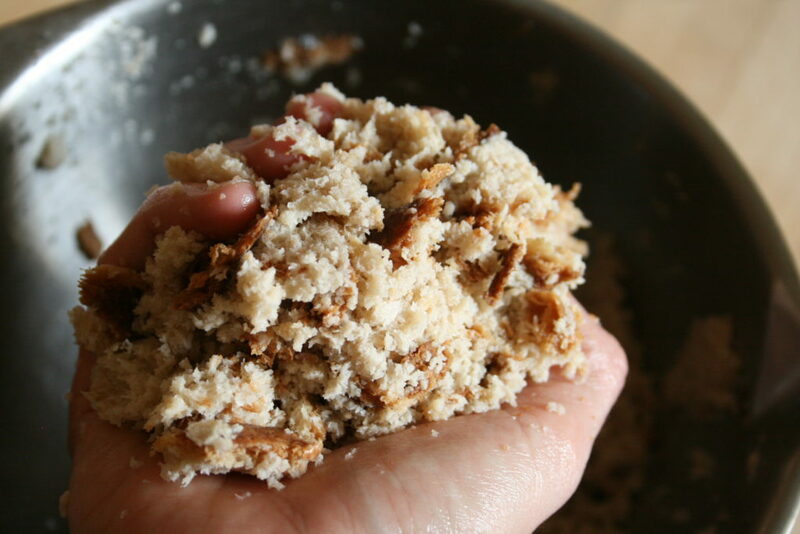 Tip: These ingredients will be most thoroughly incorporated by using your hands. Don’t be afraid to get dirty! Double tip: Don’t forget to be checking on and flipping your eggplants throughout this process! 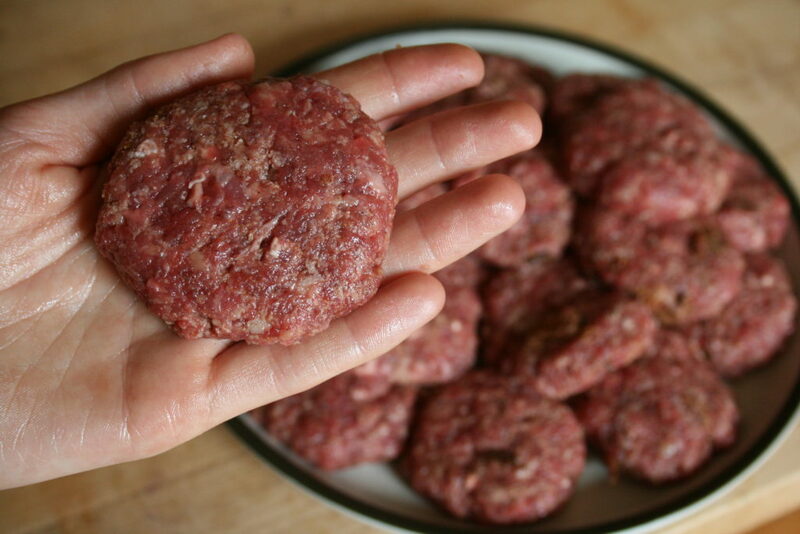 Shape the beef into patties roughly the same size as your eggplant slices. 8. Put a tea kettle on the stove to boil water for the super basic tomato sauce. While the water heats, scrape a small can of tomato paste into a saucepan with 1/2t salt. When the kettle goes off, add water to your desired consistency. We do roughly 2 1/2 c water. Wisk it together and keep it on low until its time to pour over the dish. 9. Once the eggplants are cool enough to handle, begin to build a beef-eggplant patterned spiral in a frying pan deep enough to hold a little sauce. 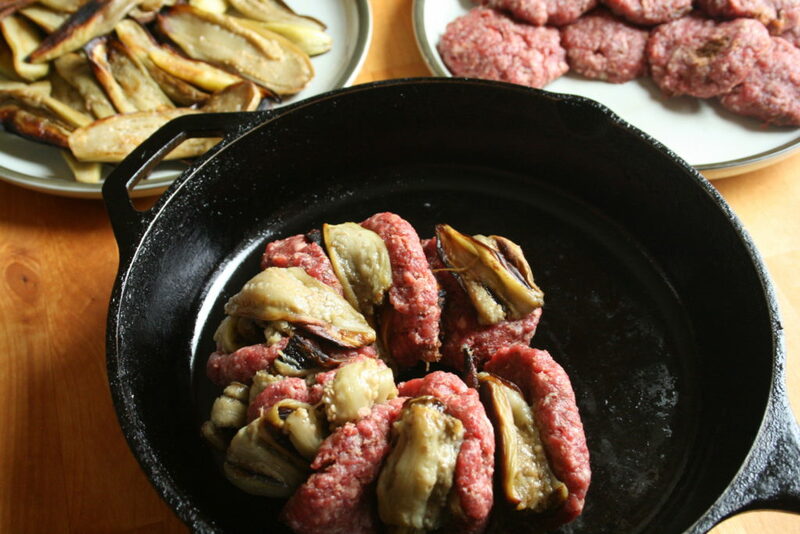 Starting in the center of the pan, place the slices vertically and alternate between beef and eggplant as you build a log that wraps around itself as shown. 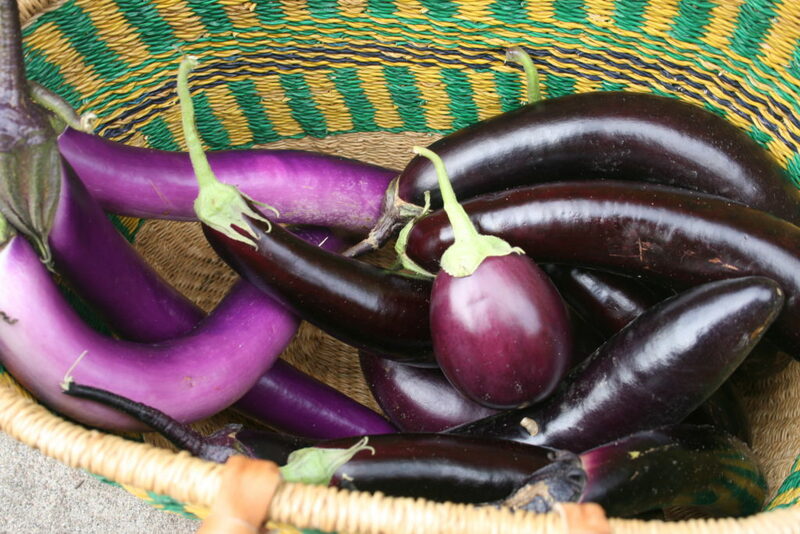 Tip: The eggplants can be broiled in advance and even kept in the fridge to make for cooler handling. 10. Place the pan on a burner at medium-high heat. 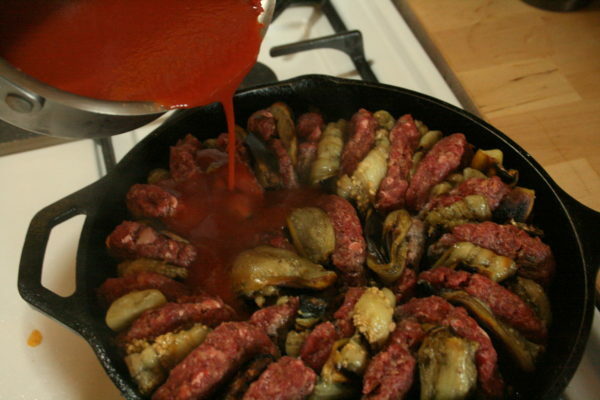 Once the dish begins to sizzle, pour the sauce evenly over the beef and eggplants. Place the cover on and continue heating the dish over the burner until the meat is cooked through. When it’s done, your house will smell INCREDIBLE! This main dish is a full meal with some simple rice and salad or green beans.